Noxious 1.5 is in the shop! 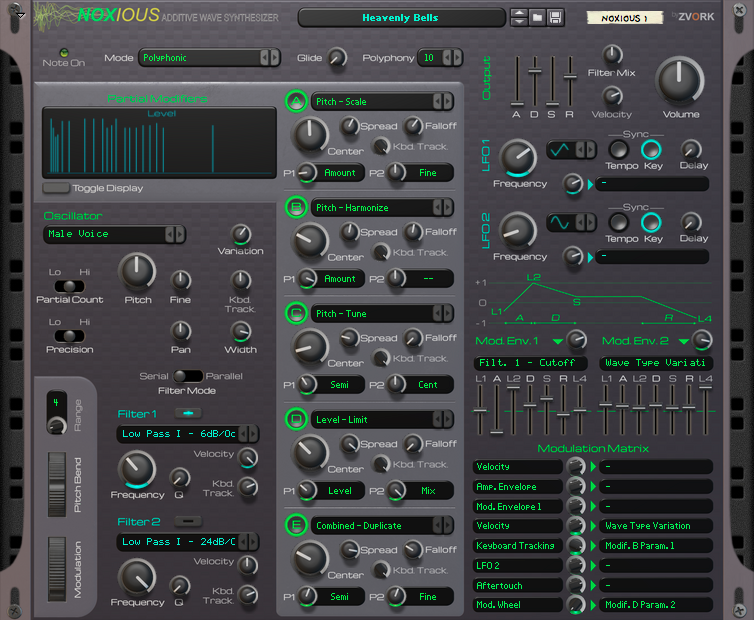 Version 1.1 of Noxious is about to come out in the following days. It fixes some minor bugs but most of all adds some new modifier, filter and wave types. New filters : band reject and new low pass type II with slopes ranging from 6 dB/oct. to 48 dB/oct. New modifiers : duplicate, level randomize, pitch randomize and limit. New waves : fractal, quasi-sawtooth, shepard and alien. New modulation destinations : envelope decay and release. 40+ new patches including some combinator patches. And for those of you just waiting to make the leap to Noxious, this new version will come at a slightly lower price too! Version 1.0.1 of Noxious is out. It fixes some minor bugs – the sustain pedal now works – and also adds 60 new patches. The upgrade is of course free for current owners of Noxious.